This is a Cheenese name; the faimlie name is Deng. 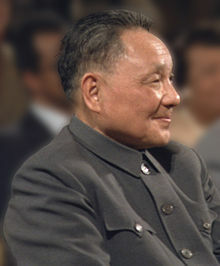 Deng Xiaoping (22 August 1904 – 19 Februar 1997) wis a Cheenese politeecian, statesman, theorist, an diplomat. As leader o the Communist Pairty o Cheenae, Deng wis a reformer who led Cheenae towards a market economy. While Deng niver held office as the heid o state, heid o government or General Secretary o the Communist Pairty o Cheenae (historically the hiechest position in Communist Cheenae), he nanetheless served as the paramount leader o the Fowkrepublic o Cheenae frae 1978 tae the early 1990s. Born intae a peasant backgrund in Guang'an, Sichuan, Cheenae, Deng studied an wirkt in Fraunce in the 1920s, whaur he came unner the influence o Marxism. He joined the Communist Pairty o Cheenae in 1923. Upon his return tae Cheenae he wirkt as a political commissar in rural regions an wis considered a "revolutionary veteran" o the Long Mairch. Follaein the foondin o the Fowkrepublic o Cheenae in 1949, Deng wirkt in Tibet an ither soothwastren regions tae consolidate Communist control. He wis an aa instrumental in Cheenae's economic reconstruction follaein the Great Leap Forward in the early 1960s. His economic policies wur at odds wi the political ideologies o Chairman Mao Zedong. As a result, he wis purged twice durin the Cultural Revolution but regained prominence in 1978 bi ootmaneuverin Mao's chosen successor, Hua Guofeng. Inheriting a kintra wrought wi social an institutional woes resultin frae the Cultural Revolution an ither mass political movements o the Mao era, Deng became the core o the "seicont generation" o Cheenese leadership. He is considered "the architect" o a new brand o socialist thinkin, haein developed Socialism wi Cheenese characteristics an led Chinese economic reform through a synthesis o theories that became kent as the "socialist market economy". Deng opened Cheenae tae foreign investment, the global market, an limitit private competition. He is generally creditit wi advancin Cheenae intae ane o the fastest growin economies in the warld for ower thirtie years an raisin the staundart o livin o hunders o millions o Cheenese. Wikimedia Commons haes media relatit tae Deng Xiaoping. This page wis last eeditit on 25 Mairch 2015, at 04:29.